Live Green, Wear Black. 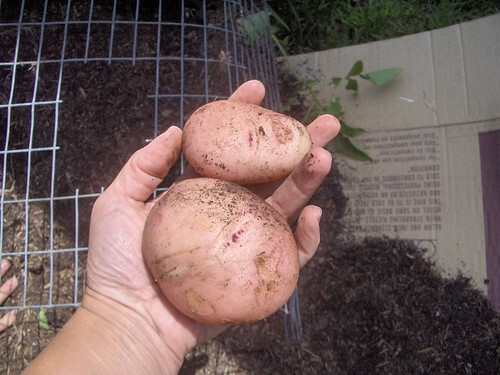 : Potato Condo Harvest! 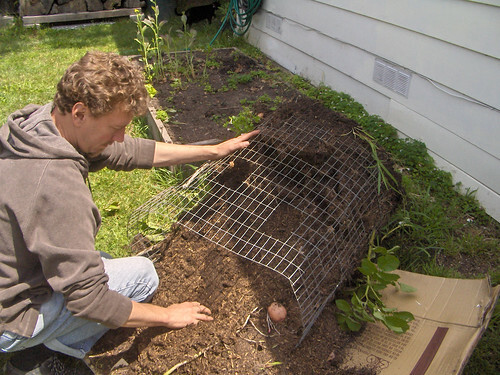 The Great Potato Condo Experiment - after growing potatoes for nearly a year, I wasn't quite sure when I should just knock it over and harvest. I do, afterall, live in a 365 day growing season (for potatoes, apparently) so none of the plants up and died or dried out on me as I expected as the signal that it was time. Over the past couple of months, I would find a few potatoes popping out of the wire mesh here and there - I even cut down the wire mesh by 2' because the soil compacted and slid out so much. Finally, with James' assistance - it was time to harvest. As he said - $40 worth of dirt for $10 worth of potatoes. I saved the plants and some of the potatoes with sprouts and put it all into 3-gal nursery pots in a different area to continue growing potatoes - here are photos of the condo harvest. 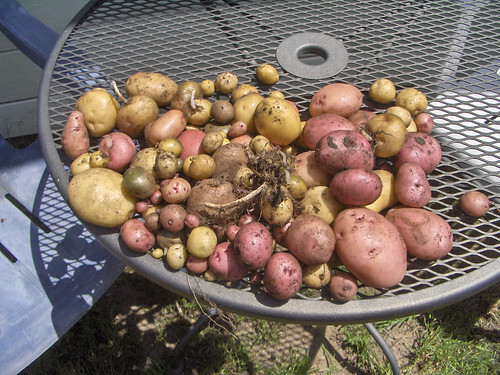 But you still have the dirt and you'll have more potatoes next year, right? It will only take 3 more years to make it back!